The GEKO lights the entire scene evenly, eliminating hotspots and underexposures, for unbeatable night-time images and secure surveillance of the area. The high efficiency heat sink body ensures maximum LED durability and protection against over-temperatures, whereas the front glass, made of special technopolymer, provides high infrared transmittance. The GEKO illuminators are protected against electrostatic discharges. 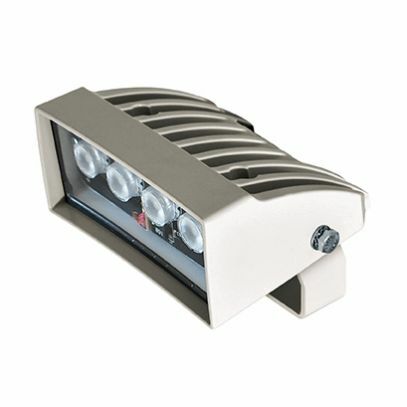 The illuminators can be powered at 12Vdc to 24Vdc or at 24Vac. The power supply in a waterproof box, in 230Vac or 120Vac version, is available as an accessory for one or two GEKO illuminators. GEKO is supplied with a wall-mount bracket that rotates horizontally and vertically and can be assembled in a housing by means of the OSUPPIR bracket.